Believe it or not, the addition of a scope to your shotgun can dramatically improve your chances of bagging that trophy Tom. And that isn’t to mention those who hunt larger game with slugs, which requires even greater accuracy with your favorite shotgun. While it’s true that you can get a bead on your target using iron sights, the assistance of a scope is like the difference between reading in fine print and reading in large print. With a quality scope, your time is much better spent and frustration is reduced to a minimum. In this guide, you’ll find the reasons that you should consider purchasing a shotgun scope, what to look for when making a decision, and finally the four scopes we most highly recommend. Shiny scopes are easily spotted. Crosshairs allow you to pinpoint your target without playing guessing games. With a scope, you aren’t tempted to raise up to check the movement of the bird or other game animal. As many hunters have learned, this is a major reason for losing that bird that seemed a sure thing. It never hurts to have a clearer view of your target. Whether you’re hunting turkeys or whitetail, a scope can improve your game to the point that you’ll wonder how you ever got along without one. Although the addition of a scope to your gun may add a small amount of weight, it more than makes up for it by making your trek into the woods so much more profitable. When you’re choosing a shotgun scope, the most important thing to keep in mind is that in order get your money’s worth, your scope will need to be tough. When you’re crashing through the thick brush or your gun slides down from the tree stand and lands against the trunk with a crack, once you’ve given thanks for the fact that it didn’t go off and kill anyone, you’ll be thankful you chose a scope that could stand up to anything your shotgun can handle. Another top priority for choosing a shotgun scope is clarity. 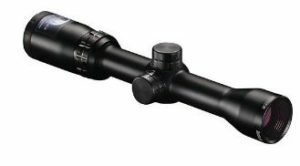 Although it isn’t necessary to buy the priciest scope to achieve maximum resolution – more about that later – there’s no point buying a scope that makes discerning the difference between your target and the background a mystery. Make sure the scope you choose provides a sharp view of whatever you point it at so your eyes get the break they’ll need when you’ve been peering so hard for so long. 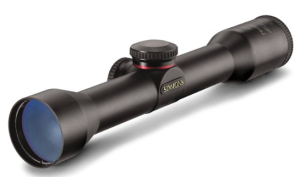 As you begin shopping around, you’ll find that different scopes offer different features. While many of these may seem tempting and like downright must-haves, keep in mind that anything that adds complication to your scope is one more thing that can break and render your scope useless. Unless you know that your scope would still work if a certain feature became inoperable, keep it simple and forego the fancy features. Although it’s true that you get what you pay for, when it comes to shotgun scopes, there’s really no need to spend an arm and a leg. As long as a scope fulfills these other requirements, don’t be afraid to settle for a scope that just gets the job done without an exorbitant price tag. 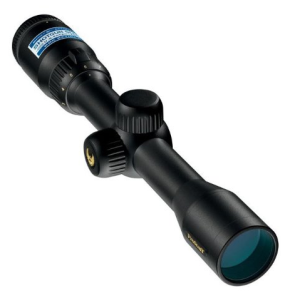 Unless you plan to make your living hunting, a cheap yet adequate scope should be all you need. Obviously, with a shotgun, you don’t have much need for long-distance reconnaissance. As long as the scope provides slight magnification, you should be pleased with the results. It would be a shame to head out with your Mossy Oak gun stock and RealTree head-to-toe camo, just to have the deer turn tail and run at the flash of morning sun glinting off your gun scope. When looking for your shotgun scope, keep in mind that camouflage is just as important for scopes as it is for gunstocks. If you can’t find a suitable camo-colored scope, a matte-finished scope will prevent sunlight from giving away your presence to any vigilant wildlife you’re trying to evade. Sure, it’s true that the brightness feature can be helpful for hunters out in the wee hours of the morning. Still, there’s no need to worry about making your scope too bright since you’ll be hunting when it’s somewhat light anyway. Why tempt yourself with ultra-bright technology when bagging that deer at night while it’s not legal to do so can get you in serious hot water. Although laws differ from state to state, good sportsmanship alone would dictate that too much technology can take the sporting chance out of the equation and cheapen the experience for everybody. With each of these things in mind, here are four top examples of shotgun scopes that should provide what you need to make your hunting experience that much more profitable. The Bushnell shotgun scope is an all-around winner. The matte black, lightweight scope isn’t crazy expensive, but its durability makes it a favorite and one that many hunters will buy again – after their first one finally gives out after fifteen years. True to its name, the Nikon ProStaff Shotgun Hunter Riflescope integrates professional Nikon technology into this cutting-edge tool to make hunting precise and smooth. The affordable Simmons ProHunter ProDiamond shotgun scope offers advanced technology at an easy-to-swallow price. The sharp focus is made possible by the use of high-quality optical glass so that you can see your target clearly, regardless of the weather. 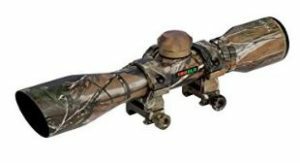 The Truglo Compact Strut N Rut Scope is an excellent choice for hunters targeting turkey and deer. It’s made of aircraft quality aluminum to provide a durable, scratch-resistant, and non-reflective matte finish that is optimal for use while hunting. Regardless whether you choose one of these fine scopes or another one not listed here, be assured that the addition of clarified sighting will improve your hunting results dramatically. Happy hunting!